There’s really something special about empowering mid-sized companies to grow and prosper. These companies help drive the American economy and create many of the great success stories that we all aspire to emulate. David Gagliardi joined Fort Point Capital in 2015 as an Associate. Previously, David was with Stifel, where he primarily focused on mergers and acquisitions for middle-market companies in the Aerospace, Defense and Government Services industry. 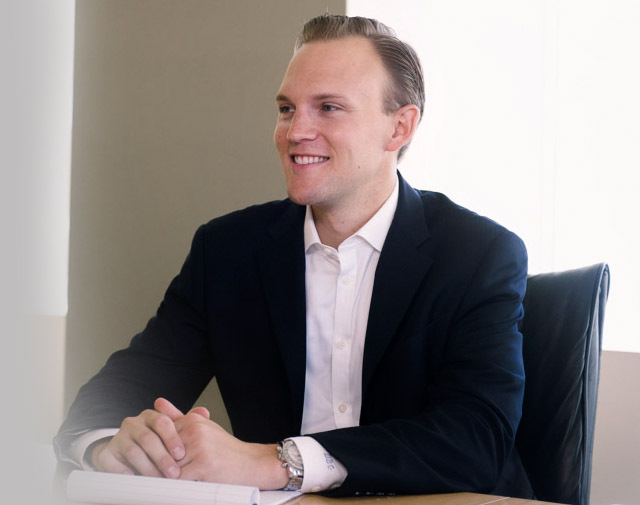 Prior to that, David began his career at Davenport and Company, where he assisted local governments, non-profits and utilities with raising capital through public and private markets. David received a B.S. in business administration from the Kenan-Flagler Business School at the University of North Carolina at Chapel Hill. He enjoys outdoor sports and traveling and is a passionate supporter of Tar Heel athletics. How did middle market private equity pique your interest? Since my time as an undergraduate, I’ve been drawn to mergers and acquisitions, particularly the long-term vision and strategic planning involved in a successful leverage buyout. Working in private equity provides a unique perspective into all that goes into identifying and building successful businesses. On a personal level, I have opportunities every day to learn and grow. It’s also exciting to be able to provide resources to help talented entrepreneurs and management teams realize their goals and execute their vision. From an investor’s perspective, I think the lower middle market provides some unique and compelling opportunities. These companies help drive the American economy and create many of the great success stories that we all aspire to emulate. They can be very rewarding to work with as well. Throughout my career, I’ve had the chance to work with a wide variety of organizations and I’ve seen the positive influence the best private equity owners can have on their portfolio companies. There’s really something special about empowering mid-sized companies to grow and prosper. At Fort Point, I look forward to partnering with great executives to achieve successful outcomes for all involved. What motivated you to choose Fort Point? The short answer is the people here. From my early discussions with the Fort Point partners, I was very impressed, not only by the extraordinary resumes, but by the disciplined approach they bring to private equity investing. It quickly became clear to me why the team has been and will continue to be so successful. The partners had a vision when they started the firm and they have all of the necessary tools to execute that vision and assemble a first-class group of portfolio companies. I was also excited about the opportunity to work on a lean team with an entrepreneurial culture. Having been a part of large organizations in my career, I sought to move to a firm where I knew I could make a meaningful impact and become a valued member of the team. Fort Point relies on each individual to bring a unique perspective to the decision process and continue to move the firm forward. That approach requires a lot of trust and responsibility, but it also allows for endless opportunities to learn, grow and contribute. Even before my first day, I felt like an important part of the team. When you have such a talented group of people working towards the same objectives, it makes it really exciting to come to work every day. How does Fort Point approach relationships with portfolio companies? While most private equity firms use the same buzz words when describing their relationships, each one approaches things a little differently. More than anything, Fort Point emphasizing partnering with exceptional management teams to provide them with the resources, not just financial resources but also deep experience and knowledge, to execute their strategies for value creation and growth. I’ve had the opportunity to work with a variety of private equity firms, but Fort Point stood out from the first time I met the team. Through years of investing experience, the partners have refined a disciplined approach to investing that will continue to benefit our portfolio companies and investors. While our hold periods certainly differ from company to company, we employ a level strategic thinking that goes well beyond the next few years. Much in the same way that every member of the Fort Point team plays valuable role, we ask each member of our management teams to act with the utmost integrity and to help propel their companies to new heights. I truly believe this culture brings out the best in people and creates opportunities to surpass all expectations. I’m fortunate enough to have the chance to work with some pretty incredible people, including both the Fort Point team and the executives at our portfolio companies. At a high level, my goal is to support the partners and management teams in a way that allows them to focus on the things they do best, like investing in and building first-rate businesses. This support can take a variety of forms, but requires constant communication and collaboration to keep everyone moving in the right direction. From an analytical standpoint, I aim to provide decision makers with the relevant information they need to shape the direction of our businesses. I also hope to bring a unique perspective to the table. At Fort Point, every opinion is valued, and I think it’s that intellectual freedom that ultimately leads to the best outcomes for our portfolio companies and investors. Is there one transaction that you worked on that makes you especially proud? I’ve always relished opportunities to help organizations navigate unchartered waters or achieve goals that at one time may have seemed out of reach. During my time in public finance, this might have been helping a municipality complete its first public bond issuance for a new school. While working on mergers and acquisitions as an investment banker, I had the opportunity to work with companies large and small. While it can be exciting to work on large corporate transactions that make news, there’s something different about helping an entrepreneur or family realize their dreams and take their companies to a new level. The first M&A transaction I worked on as a banker involved a family-owned company that had operated for 50 years and was run by the son of the founder. The company had experienced tremendous growth, to the point that it needed a financial partner to realize its potential and turn possibilities into realities. For the owner, this wasn't just another transaction, but an opportunity to continue the legacy that his father and he had built. That made our success all the more rewarding. The experience really helped shape my career path and led me to Fort Point. Being from Virginia, what are you looking forward to most as a New Englander? I have always been fascinated by American history, and you can’t walk more than a few blocks in Boston without being struck by the beautiful architecture and historical landmarks. I still have a lot of exploring to do, but I’m excited to experience the city and am proud to call this my new home. I’m also really excited to get outside of Boston and venture throughout the rest of New England. There are so many exciting destinations within a few-hour drive. I’ve never been so close to such great skiing and I’ve heard so much about the wonderful coastline. During my short time up here so far, I’ve been able to take some fantastic weekend trips to Burlington, Vermont and Cape Cod, so I’m really excited to check more places off my list. As an aspiring mediocre golfer, I also look forward to trying out many of the renowned courses in the greater Boston area.